As those of you who are familiar with my blog know, Fisher House is very near and dear to my heart as the DH and I were guests at the Fisher House in Landstuhl, Germany when our son was wounded in Iraq in '05. The Fisher House Foundation provides housing for the military, both active and retired as well as the families of military personnel who are receiving treatment at a military medical center. Fisher House Foundation has a network of 50 comfort homes in the United States. Each facility is 5,000 to 16,000 square feet, with as many as 21 suites, donated to the military and Department of Veterans Affairs by the Fisher House Foundation. There is NO FEE to stay at these homes. I have extolled Fisher House and the tremendous service they provide. We love Fisher House and will always be grateful that Zach Fisher (and the Fisher Family) so loved our military, saw a need and filled it! I also love country music... my blog posts are filled with quotes and personal reviews of country songs and performances... so I was MORE than delighted to learn that MY COUNTRY: SMASH HITS will be released on Tuesday, August 24, 2010 and that all proceeds will benefit the Fisher House Foundation!!! So you get great music for a truly great cause!! You just can't beat that. The CD is a compilation of hits from a superstar line-up which includes Rascal Flatts, Keith Urban, Brad Paisley, Lady Antebellum, Darius Rucker, Reba McEntire, Trace Adkins (in our house, the DH sometimes refers to Trace as my boyfriend and I regularly refer to Reba as his girlfriend LOL), Blake Shelton, Dierks Bentley, Rodney Atkins, Jypsi, Randy Houser, Big & Rich and Montgomery Gentry. The project is a multiple CD series with each annual volume benefiting the Fisher House Foundation. 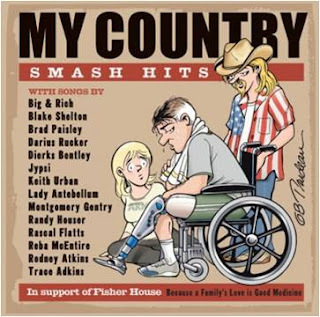 Legendary Doonesbury creator, cartoonist, Garry Trudeau graciously donated a special cartoon and designed the cover of MY COUNTRY: SMASH HITS (seen above). I hope these artists and everyone involved in this project will accept my personal thanks for undertaking this effort. You can pre-order MY COUNTRY: SMASH HITS at Amazon, Barnes & Noble, Buy dot com . Be sure to check out the Facebook page as well!! Our son deployed to Kuwait almost two weeks ago. With a day off from work I decided to go "looking" for some other military moms who might be blogging, as I have just begun. I really can't explain how I found you, but I'm thankful I have! Just reading two or three of your posts has given me valuable information that I never knew about. Thank you! I am thankful to begin getting "connected" with others!